March Bloom Day…a little late. I completely forgot about Bloom Day until it was too late to take pictures, so this month’s chronicle is a day late. 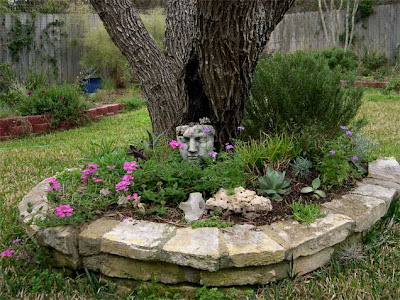 Compared to the other Austin garden bloggers, my garden still seems brown and sleepy. I completely forget to plan for this time of year with better evergreen structure and flowering bulbs. I did finally get around to adding some permanent color with three blue-glazed pots and several rose pillars spray-painted with what turned out to be a pimped-out glittery blue car paint (now I’m just waiting for the rest of my garden to bounce at stop lights). 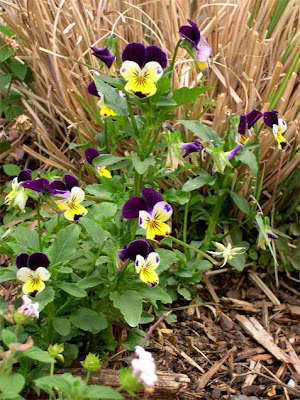 Ok, this oft-photographed viola wins my own personal award for awesomeness in winter annuals. While the rest of my violas upped and seeded out the minute the weather warmed up, this one is still cool and perky when it’s 94 degrees. I hope it sticks around for a while. 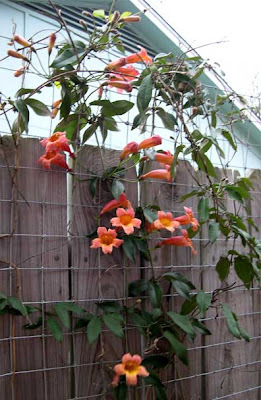 Tangerine crossvine, blooming at last! 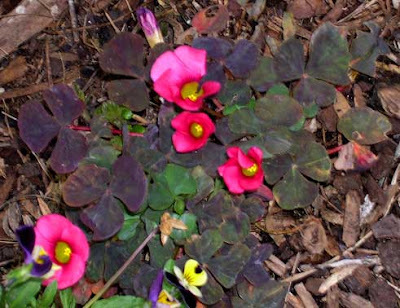 Oxalis “Garnet,” from The Natural Gardener. The pink is a bit loud for my taste, but I bought it for the cool mottled leaves. They have a distinct red-pink tinge when it’s colder. The aformentioned Agave Americana in a pot. I’ve been thinking a lot lately about hardscaping, color, and winter interest in my garden, and considering the possibilities within my budget. Last week I bought three matching blue-glazed pots to space throughout the garden, and hopefully guide the eye to some nice all-season views. 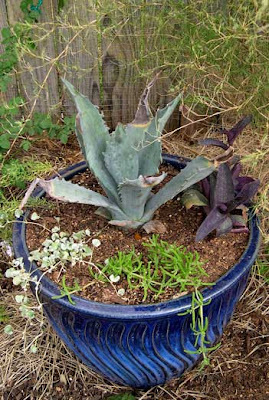 So far two of the pots have been planted with the agave, and the third is waiting for a bed redesign. The pot by itself is heavy enough that I know once it’s filled with dirt and extra-pointy agave, it’s not going to be moved again any time soon. Anyway, I like the contrasts of the blues with the purple. 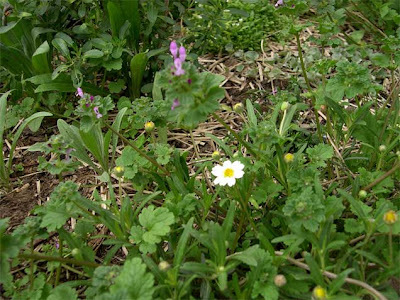 Henbit and the first Blackfoot Daisy. 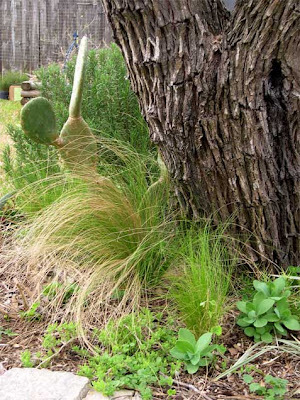 I scattered so many bluebonnet, bachelor’s button, and viola seeds there, and what came up, despite my faithful watering? Henbit. Sigh. I’ve had no luck so far with direct-sowing winter and spring flowers, which I find especially depressing when I add up how much I’ve spent on seeds. It’s too bad I have equally lousy luck starting seeds in flats. Maybe the bluebonnets will sprout next spring? My fingers are crossed. And yet another picture of “Marilyn’s Choice” abutilon. The longer I have this plant, the more I like it. It flowers right through the extremes of Austin winter and always looks good. I’m hoping it can deal with the heat with as much grace as it’s dealt with the cold. At Barton Springs Nursery last week, I saw a much, much larger version blooming in a pot. I’m hoping mine will grow up to look like that one. It’s too bad I didn’t have my camera. 9 Responses to March Bloom Day…a little late. I really like the Walking Stick–very cool. And I have henbit in bloom, too! Forgot to put it on my bloom day list. Hi Lori,I’m glad you commented on my blog, as it led me to yours (I’ve been latent, shall we say, in my blogging and in keeping up with newish blogs out there). Great stuff!Can you tell me how you did the wire on your fences that you’ve trained the vines on? We’ve got a new privacy fence and I want to grow a slew of annual vines in the hopes that my yard will be cheery for an October wedding. But first I’ve got to figure out what the vines will hold onto. Yours look good.Thanks! Hi Lori,(Pardon the repeat commenting — I didn’t realize it wasn’t my log-in on the computer. )I’m glad you commented on my blog, as it led me to yours (I’ve been latent, shall we say, in my blogging and in keeping up with newish blogs out there). Great stuff!Can you tell me how you did the wire on your fences that you’ve trained the vines on? We’ve got a new privacy fence and I want to grow a slew of annual vines in the hopes that my yard will be cheery for an October wedding. But first I’ve got to figure out what the vines will hold onto. Yours look good.Thanks! Love the blue pots. Love the violas. Henbit is cool, it has blooms. Just call it lamium as you’re pulling it out before it seeds. Hint for poppies: Don’t plant all your seed at once. 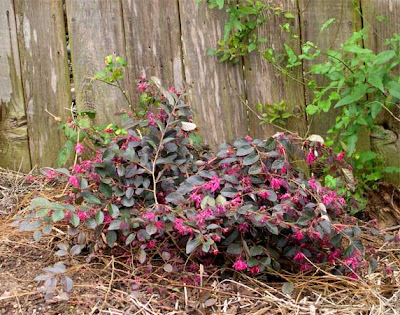 Try some in fall, plant more in the same spot in January, sprinkle a few more first of March, just in case. They don’t want covering at all, need light to germinate. I know which abutilon you’re talking about at BSN. It IS gorgeous. 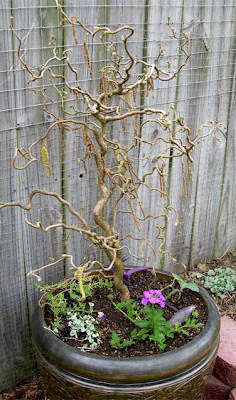 If you and other bloggers keep posting pics of your abutilons, I’m going to break down and get one too.I love the way you’ve planted your walking stick. It’s a great focal point. BSN is usually pretty good about carrying plants that grow well here, so I hope it succeeds for you. If it doesn’t, I think trifoliate orange might be a good substitute.